Chiatura, in western Georgia, once supplied nearly half of the world’s manganese, but today it resembles an apocalyptic ghost town. The film follows a few of its remaining inhabitants: Zurab, the music teacher, who dismantles concrete buildings and sells their iron girders to provide for his family; Archil, a miner whose real passion is amateur theatre; and two young, malnourished athletes stoically training for the next Olympic Games. 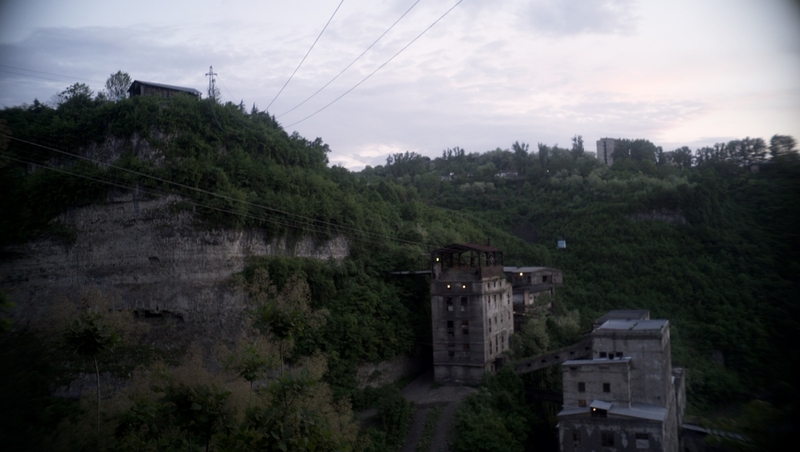 Director Rati Oneli provides insight into a living environment whose bleak industrial ruins appear like a colossal film set; a city where electrical wires and aging cable cars flow like clogged arteries in an ailing organism. And yet, in a city where the sun never seems to shine, the inhabitants generate the most valuable of resources – humanity. Rati Oneli was born in Tbilisi, Georgia, and lived in New York from 1999 to 2014, after which he returned to Georgia to make his documentary, City of the Sun. Oneli specialized in Middle East Studies, as well as International affairs, at Free University Tbilisi and Columbia University in New York. He is currently pursuing a PhD in Philosophy at the European Graduate School. In 2014, he produced and co-edited Invisible Spaces, a short film that premiered at the Cannes International Film Festival, and which was nominated for the Palme d'Or. His next production, Lethe, premiered in 2016 at the Director’s Fortnight, Cannes International Film Festival. City of the Sun is Oneli’s first feature-length documentary.